One year ago this month, the first Turkish jets bombed the outskirts of Afrin Canton, a peaceful Kurdish region in northwestern Syria. The military operation that followed, conducted by the Turkish military and members of the so-called Free Syrian Army, devastated an area that had known relative piece throughout Syria’s brutal war. In March of 2018, hundreds of thousands of people were forced to flee, as occupying forces closed in on the center of Afrin city. The final days of the campaign were the most brutal, with Turkish airstrikes targeting overcrowded residential neighborhoods where people displaced earlier had fled, and even bombing Afrin’s main hospital. While the conflict has since faded from the headlines, it is still a grave reality for the displaced people who fled to Shehba, where makeshift refugee camps were set up with the limited resources available there. Shehba is a small region north of Aleppo, surrounded by Syrian government forces on one side and Turkish-backed rebels on the other. Liberated from ISIS in 2016, its infrastructure is still devastated, and mines left by ISIS still pose a danger to civilians. Invasion, occupation, and displacement have been devastating for all of Afrin’s people— especially women, who have been targeted for violence and intimidation by occupying forces and who struggle to care for their families with the few resources they can find. In turn, however, Afrin’s women have been a key part of the resistance to Turkish occupation and the re-organization of life in Shehba. Women’s solidarity campaigns have spread across Rojava and the world, raising money to help displaced people and working to break the international silence on the crimes committed by occupying forces. Delal, a Kurdish woman from Bakur who was previously living in Austria, came to Rojava to work as an activist with Kongra Star, Rojava’s confederation of women’s organizations. She told The Region that she had always wanted to go to Afrin itself, but was unable to because of the occupation. Instead, she traveled to Shehba to work with refugees there— and to share their stories with the world. “My job as an activist with Kongra Star was to find out how many people live in each camp and what supplies the displaced people in each camp need most. We are working to help the people from Afrin, and to make people around the world aware of these events,” she said. Delal described the difficult conditions Afrin refugees continue to face, nearly a year after they were forced to leave their homes. Heyva Sor, the Kurdish Red Crescent, is the only NGO consistently operating in Shehba. Other international organizations operating in Syria have not been able to access the area. Despite these hardships, women in Shehba are working to rebuild some semblance of normalcy. Delal described the women of Afrin as “experienced organizers,” who had participated actively in different dimensions of social and political life in their communities before the invasion. “The women from Afrin were free and unaffiliated. They participated in the revolution— many of them also worked for Star Congress,” she explained. Their goal, like that of millions of displaced people across Syria, is an eventual return to their homes. 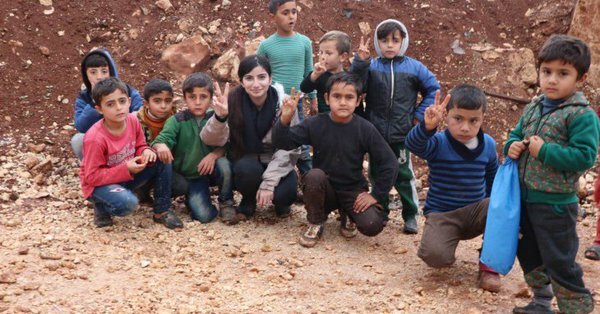 “When I asked them what they wanted, everyone said the same thing: “We just want to go back to Afrin, we do not want anything else,'” Delal explained.